Back in 1999, our company was born of the true revolution in health-promoting diets for companion animals. As a holistic veterinarian formulator, I’m proud to say our nourishing formulas have made a real difference for the dogs and cats who enjoy our products every day. As many Life’s Abundance customers have witnessed firsthand, simply feeding a dog or cat appropriate nutrition can go a long ways to promoting health. But how exactly does food alone help to protect wellness? In the following, we’ll explore four ways that nutrition packs a powerful punch! One of the best ways you can protect your pet kid is by building up his or her immune system. The scientific evidence is clear … a stressed body has a lower immunity compared to a non-stressed individual. Veterinary behaviorists are just discovering sources of stress in companion animals. Many focus on domesticated cats, who have on the evolutionary scale only just recently made the switch to indoor living. Even though we don’t know all the things that cause stress, or even recognize all the symptoms of stress in pet kids, we do know that actively trying to improve their immunity with proper nutrition is worthwhile. At Life’s Abundance, we were one of the first to add fruits and vegetables to our formulas. They naturally offer huge amounts of flavanoids, vitamin E, C and so much more. Antioxidants are just one of the many reasons doctors and dieticians say, “eat your fruits and veggies!” A 2002 study suggests that antioxidant supplementation can achieve sustained increases in circulating levels of antioxidants that exert a protective effect by a decrease in DNA damage, leading to improved immunological performance. Our formulas feature guaranteed levels of Vitamin E and C, as well as guaranteed amounts of probiotics, important to gut health and immunity. 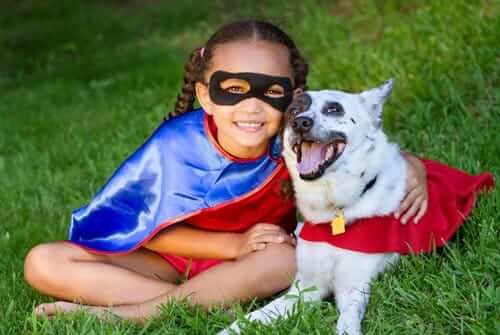 Joint health, which affects one’s ability to get around, is obviously important to your pet kid’s quality of life. Foods and dietary supplements that contain natural sources of glucosamine and chondroitin sulfate have been scientifically shown to promote cartilage, joint and connective tissue health. This is done by decreasing the enzymatic activity that breaks down cartilage in canine joints. These compounds, along with other synergistic ingredients, are found in Life’s Abundance Agility Supplement. Possibly even more important to your pet kid’s joint health is maintaining a healthy, size and breed-appropriate weight. Your first clue that your dog or cat is too heavy is when you cannot easily distinguish the ribs (and the spaces between them). Measure out proper meal proportions for your companion animal, using the recommended servings as a guideline, to help maintain an ideal weight. If your dog needs to shed excess pounds, I strongly encourage you to cut back on portions and consider switching to our Weight Loss Formula for Adult Dogs. Of course, I can’t stress enough the importance of regular exercise, which also supports joint and bone health. For cats and dogs, skin and hair condition reflects overall health and well-being. If your cat has a matted, greasy coat, or your dog’s once shiny coat has grown dull over time, these are examples of the body sending clear messages that something is up and you should schedule an appointment with the veterinarian. To maintain healthy skin and coat, dogs and cats need to eat the appropriate ratio of fatty acids. Dogs cannot produce omega-6 fatty acids on their own, so it’s vital that they consume sufficient amounts through diet. In fact, new research is highlighting the importance of adding omega-3 fatty acid supplements to daily intake as well, but in proper ratios with other fatty acids. Omega-3 fatty acids are particularly important for pregnant dogs and for puppies, as they are required for brain and retinal development. Many people don’t realize, but your pet’s digestion starts with his or her teeth! Brushing your pet’s teeth at home, coupled with routine oral health check-ups at the vet, can have a phenomenally positive effect on your pet’s health. Giving your dog a daily dental treat and safe items to chew can benefit overall health and digestion. And that’s just the beginning of a healthy digestive system. To keep things moving along the entire tract, all Life’s Abundance dry foods are formulated with prebiotic fiber, a plant-based carbohydrate that produces fatty acids. These fatty acids provide energy to the large intestine and promote overall health of the entire intestinal system. We live in a very exciting and fortunate time. With all these advances in nutrition and veterinary medicine, our beloved pets will benefit, living longer and being healthier. Massimino S1, Kearns RJ, Loos KM, Burr J, Park JS, Chew B, Adams S, Hayek MG. Effects of age and dietary beta-carotene on immunological variables in dogs. J Vet Intern Med. 2003 Nov-Dec;17(6):835-42. Super insightful, thank you! Some great facts I can pass onto future customers. This is a great article of information why our Life's Abundance line of pet products are extremely healthy from head to tail. This would be excellent to pass on to perspective customers. Thank you for providing our furbabies the best for the past 13 years. We do remember those "Gravy Train" commercials and pet food has come a long way. We're so glad to have found you and so are our dogs. We have been feeding our dog since early puppyhood he gets the large breed puppy food. Our cats love their their kitty food from your company and being a member of a community I trust is great. Never having to worry about their nutritional needs is worth its weight in gold. Thanks, Dr. Jane for giving us more valuable information to share with our customers. I enjoyed reading this and am eager to share with others! Very informative. The article show how important a pets health is. Great article. My senior dogs (11 and 13) are doing great thanks to these products! Very well written and thought provoking article. I believe that what we put into our dogs is what we get out of them. Great information to share with the general public! This article was very helpful. It helps me to be more knowledgeable on why nutritious dog food like Lifes Abundance is so important. As usual, great information from Dr. Jane. Virgil and I have learned SO MUCH about dog and cat wellbeing through nutrition from our association with Life’s Abundance and with Dr Jane Bicks. Before we knew about Life’s Abundance, we believed—as a lot of people do—that one pet food or treat was basically as good as all the others. There is such a wealth of information about pet nutrition, and we thank Life’s Abundance for opening our eyes and for helping us provide a far more nurturing nutritional life for all our animals! I've heard so much about how Life's Abundance creates a healthy pet and healthy/shiny coat. Excited to see the results with my two new litters. Love the food! My dogs are all thriving on it. I have a few rescue dogs I adopted an they had horrible coats and skin they are so happy and there coats are like silk no skin issues at all . I've had Goldens to my whole life and never a skin issue which is amazing especially for the breed . I plan on starting the program you have offered for people for myself as well as becoming a distributor I this product . I have told so so many and they all have purchased it with no regrets there dogs are thriving and less trips to the vet for throw up and loose stools . THANK YOU for such a wonderful product and saving all the lives you do . I am a forever client and will continue to help spread the word so many more family's can be as satisfied as I am with such a dependable product . What a difference quality ingredients can make! It's a comfort to know that premium products like these don't have to come at a premium price. Thank you. Balanced nutrition is so important, I meet so many people that feed there dogs inexpensive food and you can see the difference in their coat and health. We have seen a tremendous difference in how well our dogs age compared to our previous dogs that were on less healthy food. I have been making homemade dog treats for my dog. Some of the ingredients are : whole wheat flour, white flour, peanut butter, canned pumpkin, eggs, sweet potato, grated cheese. Is there anything I should not be giving my dogs? I have 2 golden doodles and they love their baked treats. One is 9 years old and is usually 60 pounds and I found out is now 68.5 pounds . She eats life abundance dry food since she was puppy. She is now on a diet. Should I change her food to a low fat dry food? My four-legged babies are everything to me. Life's Abundance products have kept my babies healthy and strong since 2004! Thank you Dr. Jane Bicks for developing the BEST pet food on the market!!! This article is very informative. It shows why Life's Abundance dog food is so highly rated. I am excited for my dogs to sample it! I am so excited to learn more about Life's Abundance. These articles are so informative. Just confirms why I love Life's Abundance. So informative and helpful. I feel so good knowing my pets are getting top quality food. Thank you Dr Jane for the valuable information on pet nutrition. We've been using Life's Abundance products for over 10 years and our dogs are happy & healthy because of it. We appreciate the quality of all your pet products! I just love the ingredients in Life's Abundance food. I am so happy that my dogs are getting such great nutrients in their diet.